A number of readers have written to ask about running the example code in C++ All-In-One Desk Reference For Dummies. The book shows that the examples pause so you can see the output, yet a few people experience problems getting the example to pause as shown in the book. Let’s take the first book example. When you run the example, you should see a command window similar to the one shown here open. This is how the command window looks in Windows, but if you use some other operating system, you should see something similar. Notice that the output is paused. Pressing any key will cause the window to disappear and the example to end. The purpose of pausing the output is so that you can see the result. There are two common reasons that people aren’t seeing the output pause. The most common reason is that the example is run in debug mode. Make sure you click Run or choose Build | Run to execute the example. 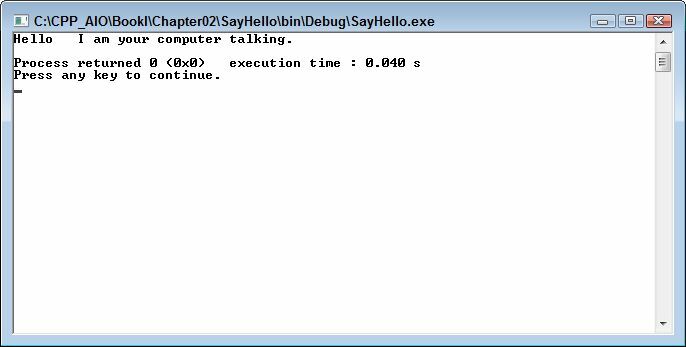 If you click Debug/Continue or choose Debug | Start/Continue instead, the example will execute without pausing and you won’t see the output. Of course, you can always set a breakpoint to get the example to pause, but most people simply want to see the example output which means running the example, rather than debugging the example. A less common cause is that the project environment is configured incorrectly. Normally the Code::Blocks environment automatically pauses when you run the example. However, it’s possible to set Code::Blocks not to pause. Some readers inadvertently change this setting while exploring the environment. 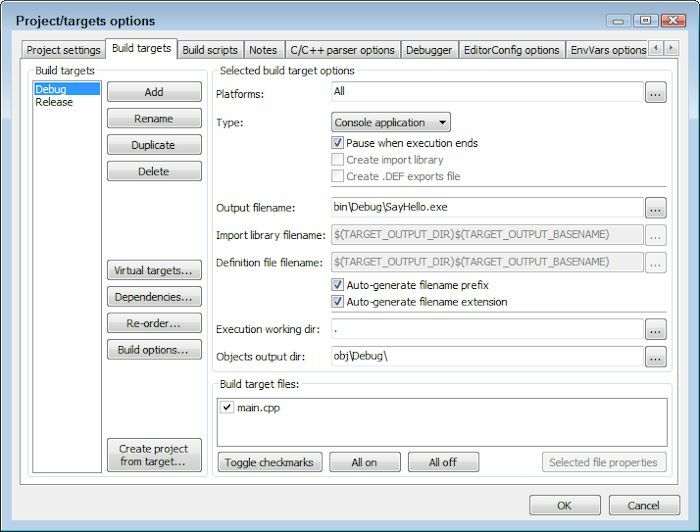 In order to check this setting, choose Project | Properties to display the Project Targets/Options dialog box. Select the Build Targets tab and you see the dialog box shown here. Notice the Pause When Execution Ends option. If this option is cleared, the example won’t pause when you run it. Make sure this option is checked and click OK. The projects that come with the downloadable code all have this setting set up correctly. Of course, there could always be other reasons why the examples aren’t pausing. Please let me know if you have any problems setting the example output. It’s essential that you be able to see the example output as you follow along in the book to understand how C++ works. Send your queries about this (or any other book-specific) topic to John@JohnMuellerBooks.com. I always want to ensure you have the best possible experience when using my books. // Create a variable to hold the user data. // Create a variable to hold the group data. // Perform the default configuration. // Check for the user data. // Initialize the user data. // Check for the group data. // Initialize the group data. // Fill the administrator provided task and project lists. // Otherwise, use the supplied settings. In both cases, the constructor must create the UserData and GroupData local variables that you’ve seen used for so many purposes in the application. When the caller supplies the required data, frmConfigure uses it. Otherwise, frmConfigure creates new, blank variables that the application can fill with data. No matter how the data are supplied, the constructors call FillLists() to fill the user interface with data so that the user can see the settings (if any). // When there is user data to use, display it. // Configure the form fields. At this point, the form is ready for the user to interact with. We’ll be looking at some additional code later to handle the requirements for working with administrators, versus standard users. For now, just consider that the form is ready to use. The user does whatever he/she needs to do, and then clicks either Cancel or OK to close the form. Now, some actions automatically save data because you simply don’t want to take a chance that the user will close the form in some other way and lose settings. However, it’s important to save the data one last time when the user clicks OK to ensure absolutely every change appears on disk. That’s the purpose of the two event handlers shown here. // Close this dialog box. // Save the changes to the user data. // Save the changes to the group data. // Close the dialog box. As you can see, clicking Cancel simply closes the form. However, when you click OK, the application saves the data as it appears on screen. This is important because it’s possible that things could have gotten out of sync as the user interacted with the form. The result of the btnOK_Click() event handler is that the data on disk appears precisely the same as the user saw it on screen. At this point, you have a basic frmConfigure completed. The next post will focus on the code used to make frmMain work. In the meantime, let me know if you have any questions about any of the frmConfigure code at John@JohnMuellerBooks.com. Last week, in the Exploring the TimeCheck Application (Part 11) post, you discovered some of the requirements for making the Add, Edit, and Delete buttons for the Standard Project Entries and Standard Tasks lists work. This addition included creating a new dialog box so that the user could provide the information required by the lists. Now that you have the basics down, let’s look at the code for performing the task. This first bit of code performs tasks with projects. // Create the project dialog box. // Display the project dialog box on screen. // Create a new project and add it to the list. // Update the list information. // Make sure the user has selected a value to edit. // Display a message box telling the user to select an item. // Exit the event handler. // Edit the existing project name and save it to disk. // Make sure the user has selected a value to delete. // Remove the selected project from the list. The btnProjAdd_Click() event handler begins by creating the default frmProjectTask object, ThisProject. It then displays the dialog box. When the user clicks OK, the code creates a new Project entry, NewProject, adds the project name to it from ThisProject.txtProject.Text, adds the entry to GroupData.ProjectList, and then saves GroupData. Now you know why ThisProject.txtProject.Text has to be public. There are other ways you could handle the situation, such as using a property, but this approach is faster and shouldn’t pose any security issues. You must save the changes by calling SaveSettings(). Because the list has changed, you must call ClearLists() to remove existing data from the lists and FillLists() to add the new data. In most respects, the btnProjEdit_Click() event handler works like the btnProjAdd_Click() event handler. However, in this case, the user must choose an entry to edit, rather than create a new entry. When the user has failed to select an entry, the code displays an error message and exits. As before, the code displays the dialog box, but this time it changes the button and title bar text to reflect the difference in task. In addition, the code modifies the existing entry, rather than creating a new one. As before, you must call both ClearLists() and FillLists() to update the application. Deleting an entry in the btnProjDelete_Click() event handler is the simplest of the three tasks. The code begins by verifying that the user has actually selected an entry and reacting if the user hasn’t. It then looks for the requested entry in the list and calls RemoveAt() to remove the entry from the list. A call to ClearLists() and FillLists() completes the process. The three event handlers for tasks work much like those used for projects. Of course, the code makes additional changes to the frmProjectTask dialog box to ensure the user sees the right information. Here is the code for these three event handlers. // Create a new task and add it to the list. // Create the task dialog box. // Remove the selected task from the list. As you can see, the differences aren’t all that much. Well, that’s it for this week. Please let me know if you have any questions at all about the code for these six event handlers. Next week we’ll begin looking at the code for some of the other configuration dialog box controls. In the meantime, contact me at John@JohnMuellerBooks.com with your questions and concerns. You can read the next segment in this series at Exploring the TimeCheck Application (Part 13). The user manually configures some of the settings in the UserSettings class by selecting items such as the default task and project. The administrator manually configures some settings in the UserSettings class by selecting items that only the administrator can see. The application automatically provides default settings in the UserSettings class when the application hasn’t been configured by either the user or the administrator. The administrator manually configures all settings in the GroupSettings class. The application doesn’t automatically supply any defaults for the GroupSettings class and simply displays blank screen areas when there are no values to display. I wanted to reiterate these settings requirements before moving on because there were some questions on the part of a few readers as to how the settings worked. I’m not showing the security features of this example just yet—for right now, it’s important to focus on the functionality required to perform the desired tasks. However, I do encourage developers creating production applications to include security as part of the application design and development process (as I did when putting this example together). You can’t bolt security on as an afterthought. However, I have chosen to not discuss the security features just now in order to make the example easier to understand. Because I’m still answering some questions about this application, I’ve decided to keep today’s post simple. Look carefully at frmConfigure (see Exploring the TimeCheck Application (Part 3) for details on the frmConfigure configuration). This form contains two combo boxes and two list boxes that you must fill at various times during the use of the form. For example, you must fill all four of them when initially displaying the data. Any change to the two list boxes must also appear in the two combo boxes. In addition, changes to group data must appear every time the user decides to make any sort of change to the user settings, so you have an opportunity here for interactions between multiple sessions. Because of the potential for problems, the frmConfigure class uses a method named FillList() to fill all four lists any time there is a chance for changes. The following code shows how FillList() works. // Check for a list of tasks. // Fill the default and administrator lists with data. // Check for a list of projects. // Add the "None" entry to the two user lists. // Choose the user-supplied default (if any). Any time there is any change to any of the data that frmConfigure manages, the code calls FillList() to ensure all of the lists are updated. Using a single method like this makes it possible to update the application without any potential problem with method interactions. In this case, the code works with GroupData.TaskList and GroupData.ProjectList to obtain entries for the two lists associated with a particular data type. The user lists must also contain a None entry, so the code adds this item to the two combo boxes after the lists are filled. Having the None option last helps ensure that the user actually reviews the lists of potential choices before accepting the None option. Using a foreach loop to fill each list is extremely efficient. The FillList() method must also interact with UserData to automatically choose the user’s selection of a default task and a default project. Remember that the default selection, the one automatically created by the application, is None. When the user hasn’t made a selection, the Configure TimeCheck dialog box displays None for these two entries. This code provides a subtle form of error handling. Theoretically, GroupData.TaskList, GroupData.ProjectList, UserData.DefaultTask, and UserData.DefaultProject should never be null when this piece of code is called. However, the code makes a quick null check anyway just to ensure it doesn’t attempt to work with a null data value. This quick check will reduce potential errors without affecting performance in any noticeable way. Using this sort of check will help make your applications more robust too. Well, that’s it for this week. Please keep those questions coming. I realize that this example is a bit more complicated than the ones you’re used to seeing in books, so I want to be sure I don’t leave anyone behind. Be sure to send your questions to me at John@JohnMuellerBooks.com. The Exploring the TimeCheck Application (Part 8) post helped you explore the first part of the GroupSettings class. As promised, this week’s post will help you complete the GroupSettings class. Of course, one of the most essential tasks you perform with this sort of class is creating a new instance of the class as needed. In many cases, you can use the default constructor, which requires no input and produces no output. However, when working with settings, you need to create a constructor that sets the settings to a known state as shown here. // Define a constructor to initialize default values. Setting CustomProject and CustomTask to false makes sense because you don’t want the user to be able to create custom projects or tasks unless the administrator wants to allow it. You may have heard the phrase principle of least privilege used in regard to application security and this is an example of such a setup. The application assumes that the user doesn’t have the right to perform some special task unless the administrator specifically allows it. What may concern some people is the setting of ProjectList and TaskList to null. When an administrator uses the application for the first time, there aren’t any projects or tasks assigned for the application, so that’s one reason to set these List objects to null. However, the second reason is to signal an error to the application. When a user starts the application and the application can’t find the network drive containing the group settings, it’s important to signal the application that an error has happened. This error won’t prevent the application from continuing, but it will prevent the user from logging in using standardized projects and tasks. As a result, the application must have some way of signaling this problem and dealing with it. You’ll see how this all works in a later post. In addition to creating new GroupSettings objects, the class must be able to read and write GroupSettings to the network drive as an XML file. This one file contains the settings that everyone will use. There are many permutations to discuss with regard to this sort of file. For example, you need to consider whether multiple administrators could possibly modify the file at one time. If so, you need to implement some sort of locking strategy to ensure that only one administrator can open the file for modification at a time. Of course, you don’t want regular users making modifications to the file. For the purposes of clarity, I chose to make things as simple as possible. I’m assuming that there is only one administrator. In addition, I’m assuming that because of the interface modifications you’ll learn about in a later post, that only the administrator will have access to the interface elements required to make the changes. With these restrictions in mind, here is the code the example uses to save data to the file. // Create a method for saving the settings. // Obtain the network path. // Exit when the application hasn't been configured yet. // use the application, so you need to create the path. // Check for the file. If it doesn't exist, create it. // Create an XML serializer. // Define a data stream. // Perform the data write. The code begins by creating a path variable that holds the location of the network storage location. This location is unique for an individual machine and is stored as part of the UserSettings (see Exploring the TimeCheck Application (Part 7)). When NetworkPath is null, it means that the application hasn’t been properly configured and there is nothing for the application to do, so it returns a null value to the caller. The application must also ensure that the GroupData folder exists and that it contains the AppData.Config file. When the AppData.Config file is missing, the application must create it. Remember that this task takes place across a network connection. Normally, I’d include some error trapping code here, but left it out for the sake of clarity. A production version of this application will include the required error trapping and error handling code. Once the application establishes that there is a file to use to hold the data, it creates an XmlSerializer object, DataWriter, and defines its output as type GroupSettings. The application then creates a StreamWriter to actually output the data and then serializes the data as XML in the output. This entire process is precisely the same one that is used for the UserSettings class, except that it happens across a network connection (with all of the potential for problems that a network connection can cause). In fact, I encourage you to compare this method to the one used for the UserSettings class. Everyone will use the method to obtain the data from the file. You don’t need to implement much in the way of special handling because the file is read and immediately closed. If there are a lot of users to accommodate, you may possibly need to add file locking features to the application. However, since there is no modification of data taking place, allowing shared access works just fine in most cases. Here is the code used to read data from the AppData.Config file. // Create a method for obtaining the current settings. // Create an XML deserializer. // Perform the data read. It’s a good idea to compare this method to the one used with the UserSettings class to read the user data. The basic concept is the same. The only difference is that this class works across a network connection, so the production version of the application will likely contain additional error trapping and error handling code. Well, that’s it for this week. Next week we’ll discuss any remaining internal elements or possibly move on to a few of the user interface elements depending on what sorts of questions I receive about the application. In the meantime, please let me know about any questions or concerns you have about the application at John@JohnMuellerBooks.com. You can find the next post in this series at Exploring the TimeCheck Application (Part 10). The previous post, Exploring the TimeCheck Application (Part 7), discussed the UserSettings class, which is used to store user settings to the local hard drive. One of the most important settings included in this class is NetworkPath, which points to the location of the group settings and time logs on the network. Using centralized storage makes it possible for an administrator to set the configuration of all systems on the network at once and to also get reports for the activities of all users, even when the target user is offline. Of course, you could always use a local drive for the NetworkPath when you’re the only one working with TimeCheck. No matter where you store the data, the next level of settings are the group settings used to control the overall functionality of the application. These group settings are the target of today’s and next week’s posts. The first step in this process is to create some classes. The GroupSettings class contains the actual settings you work with. However, to ensure that you can define tasks (the kind of work the user performs) and projects (the client or area of the company that is the client for the work) as you see fit, you also need to create the Project and Task classes. You can create all three classes (GroupSettings, Project, and Task) using the techniques found in Exploring the TimeCheck Application (Part 7). The Project class is quite simple in this example. All you really need is the name of the project as shown in the following listing. Notice that this class is marked as [Serializable()], which is a requirement when working with XML storage files. An implementation for a larger organization could include additional information, such as the client contact information. The idea is to create properties that define what a project is to your organization. In my case, all I need is the project name. The Task class for this example is similarly simple. All it contains is the name of a task that the user might perform, such as word processing or graphics. Here is the source code for this part of the example. As with the Project class, you must mark the Task class as [Serializable()]. Even though my class contains only the name of the task, you could easily expand this class to include other information, such as a list of work groups that normally perform this task. The use of a class makes it possible to expand the definition of a task as needed to match the requirements of your organization. In order to start coding the GroupSettings class, you must provide both file and XML support. You need to add the following using statements at the beginning of the file. // Add these statements to your project for XML support. // Add this statement for file system support. Look again at frmConfigure in Exploring the TimeCheck Application (Part 3). The top half of this form relies on the UserSettings class, while the bottom half relies on the GroupSettings class. There are four properties that support the four fields shown in the bottom of frmConfigure as shown here. // Determines whether custom projects are allowed. // Determines whether custom tasks are allowed. // Contains the standard list of group projects. // Contains the standard list of group tasks. Notice that the CustomProject and CustomTask properties are simple Boolean values. They never require any error handling because the properties are set using a simple check on the form. The ProjectList and TaskList properties are a List object of type Project and Task. Using generics solves some problems later in the application and makes the code easier to understand and work with. The example application uses the simplified property setup for these properties as well because the application never does anything with the strings except to display and store them. If the application had processed the strings in some way or the Project or Task classes were more complex, then the properties would have to include some sort of error trapping. Keep this in mind if you decide to enhance the example code in some way. That’s it for this week. Next week you’ll see how to complete the GroupSettings class. Please let me know if you have any questions about this class or any other part of the TimeCheck application at John@JohnMuellerBooks.com. I’m sure a number of you were wondering when I was going to get back to the TimeCheck application (if ever). I always want to be sure that I provide good material for you and things have been hectic this summer. Of course, we were off on vacation for a while, then there was my little equipment failure, and the drought has brought problems of it’s own. Now we’re back to working on this example. Right click the TimeCheck entry in Solution Explorer and choose Add | New Item from the context menu. You’ll see the Add New Item – TimeCheck dialog box shown here. Highlight the Class template in the middle pane. You see a description of the purpose for this template in the right pane. Type UserSettings.cs in the Name field and click Add. 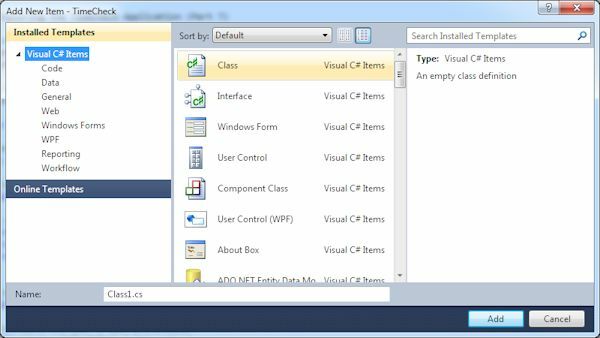 Visual Studio adds the new class file for you and creates some basic code for it. Let’s begin at the top of the new class file you’ve created. In order to support the code for this example, you must add some using statements to the top of the UserSettings class file as shown here. The user’s settings for this example reside on the user’s hard drive. The application must know where to find the network drive with the group settings. In addition, each user can select a default task and a default project. Consequently, the user settings consist of these three properties. // Contains the user's project preference. // Contains the user's task preference. // Contains the location of the data on the network. You don’t need to perform any special checks in this case because the application will perform them automatically and the user won’t be able to enter anything that will crash the application. Using this shortcut method of creating properties works just fine for this part of the example. The default constructor for any class doesn’t do anything. Yes, C# supplies a constructor because you absolutely must provide one, but it’s useless in this case because you need to initialize the properties. The next step is to create a new default constructor that performs the tasks needed as shown here. // Create a default constructor. Now we get to the meat of the class. The class must provide static methods for getting and setting the user settings. These static methods help the application work with existing data more efficiently and reduce the need to create unnecessary objects that simply use memory. The following code shows the static methods used to get and set user settings for this application. // Obtains the user settings. // Define a path to the user settings. // use the application, so you need to exit. // Check for the file. // Return the user settings to the caller. In both cases, the code begins by obtaining the location of the user’s data store on the local hard drive by calling Environment.GetFolderPath(). The Environment.SpecialFolder.ApplicationData enumeration contains the location of the root of the data store. This application stores its data in the \TimeCheck subdirectory. The next step is to ensure that the \TimeCheck subdirectory actually exists and that it contains a file named AppData.Config. When the class is getting the settings, a failure to find either the directory or the file means that there is no data to obtain, so GetUserSettings() returns a value of null. However, when saving the user settings, the SetUserSettings() method must create the required directory and file when it doesn’t exist. At this point, there is either data to get or data to save. The data is stored in XML format. In order to work with XML data, you create an XmlSerializer to either serialize (change the properties into XML) or deserialize (change the XML into properties) the data. A StreamReader or StreamWriter provides read or write access to the physical file. The code can now serialize the local data to the XML file or deserialize the data from the XML file and store it locally. Notice that the example is careful to close files immediately after use. Even though it may seem that the application would perform this task automatically, it does so only after you exit the method and may not close it immediately. In the meantime, an application error could potentially cause damage to the data. In addition, if the application must create the AppData.Config file, the application will register an access error when you try to reopen the file for reading. Well, that’s it for the UserSettings class. Next week will begin looking at the GroupSettings class (which is considerably more complicated than this class was). In the meantime, let me know if you have any questions about this part of the application at John@JohnMuellerBooks.com. You can see the next post in this series at Exploring the TimeCheck Application (Part 8).